Speculative Horoscope: The Discovery of Icarus June 27, 1949; exact hour unknown; Palomar Observatory California discovered by *Walter Baade. Timing the chart for 10:03:19 pm pst shows asteroid Icarus @11Sag29 Rx precisely conjunct Midheaven (11:29), the Goal Point of any horoscope. Listed are Carelli's symbol for '11 Sagittarius' (he doesn't round up as in Sabian Symbols) - "An Ape Riding a Wolf" and the Jones version of the Sabian Symbol for '12 Sagittarius' - "A Flag That Turns Into an Eagle That Crows" which of course is a possible picture of America's natal Ascendant in the late afternoon charts on July 4, 1776 Philadelphia, PA. Of course, an eagle is a typical symbol for America (on the Great Seal, etc) and we're accustomed to much crowing over the US flag. A related post: Is Washington DC the "New Rome"? Altair the Eagle Says Yes! Post includes the FDR Inauguration horoscopes for 1933 and 1937 to show the switch of the ceremony from early March to January 20th. 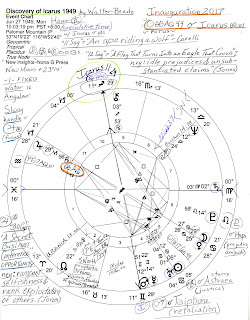 The discovery horoscope of Icarus is currently signiffficant because during Inauguration 2017 as Trump took the Oath of Office, the POTUS Sun (00AQ49) was unaspected (which we have discussed previously as a self-interested leader focused on his own importance and holding himself in high regard--Tierney) but conjunct asteroid Icarus. 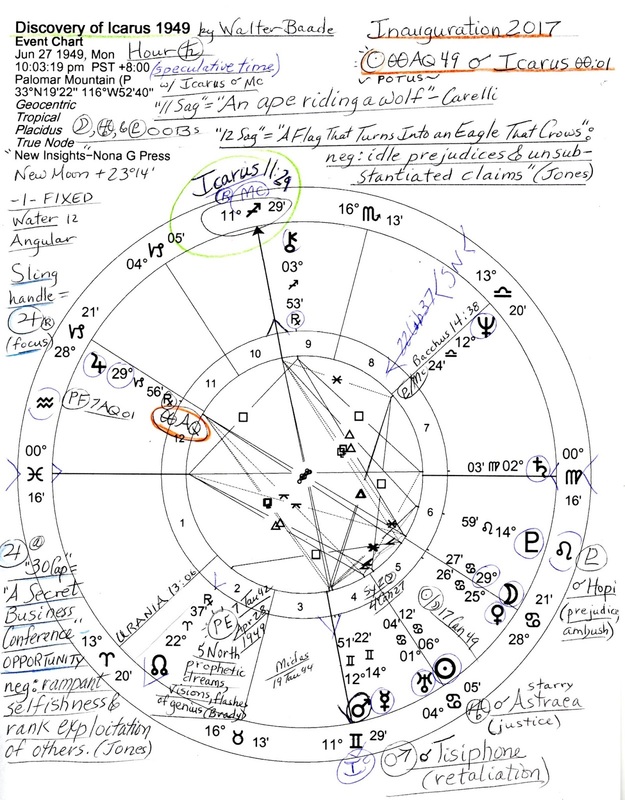 Therefore, I am relating this horoscope of Icarus to the current occupant now sitting in the Oval Office and note that he is a Jupiterian figure blended with chaotic Uranian and Mercurial trickster-esque tendencies. As you see, expansive planet Jupiter Rx (weakened) is at a critical 29th degree in 12th house of Politics and Karma and is the handle of a Sling shape which knits together two hemispheres of the chart. As handle, Jupiter's expansive energies are the focus although its expansive activities are partially held in check when in Saturn-ruled Capricorn, the sign of law, government, and business. A Moon-Jupiter opposition suggests emotional vulnerability, lack of a sense of self-worth, the need for expert advice (seldom taken), and a tendency to give others who may not deserve it the benefit of the doubt. Jupiter quincunx reforming Uranus suggests unrealistic expectations which Mr. Trump apparently possessed before stepping into the Oval Office--one example being how "easy" he thought presidentin' would be. Who knew chairing America could be so complicated? 'New Insights into Astrology' page 196 by Nona Gwynn Press (see my Amazon review! ); Icarus discovered by Walter Baade on June 27, 1949; in Greek Mythology, Icarus was the son of master craftsman Daedalus and Naucrate, a Cretan slave. Daedalus constructed the labyrinth on Crete where the Minotaur was kept. King Minos imprisoned Daedalus and Icarus in the labyrinth, Daedalus made wings of feathers and wax, and Icarus, ignoring his father's warning, flew too close to the sun, the wings melted, and predictable results occurred. The orbit of Icarus is between the Sun and Jupiter and it crosses the orbits of Mercury, Venus, the Earth, and Mars. Only comets go closer to the Sun. Icarus (#1566) contains the restlessness of Mercury, the sensuousness of Venus, the earthiness of Earth, and the self-assertiveness of Mars. Zane Stein gives Icarus a feeling of restriction, unrestrained exhilaration at escape which may be followed by a fall. House position shows where risks are taken (10th), and the practice of Politics is associated with Icarus via its 'rise and fall' nature. Assassination is also related to Icarus including character assassination (of Trump, now underway). *German astronomer Walter Baade (1893--1960) worked in the US from 1931 to 1960 and with fellow astronomer Fritz Zwicky coined the terms "supernova" and "neutron star." A total of ten asteroids were discovered including Icarus, as noted above, and Hidalgo (#944) which were known as minor planets but are now called Centaurs of which Chiron is most notable.